To delete a page that contains text, graphics, or empty paragraphs, select the content you want to delete, and press Delete on your keyboard. Tip: Click anywhere in the page you want to delete, press Ctrl+G (Option+⌘+G on Mac), and in the Enter page number box, type \page. Press Enter on your keyboard, and then click Close. Verify that a page of content is selected, and then press Delete on your keyboard. Word includes a non-deleteable end-paragraph that sometimes gets pushed out to a new, blank page at the end of a document. The way to delete the page is to make the end-paragraph fit onto the preceding page. Press Ctrl+Shift+8 (⌘+8 on a Mac) to show paragraph marks. Click inside the Font size box, type 01, and then press Enter . The paragraph now fits on the preceding page, removing the unwanted blank page. Press Ctrl+Shift+8 again to hide the paragraph marks (⌘+8 on a Mac). If that paragraph still doesn't fit on the preceding page, you can make the bottom margin smaller (Layout tab > Margins > Custom Margins, and set the bottom margin to something small, like 0.3 inches). Tip: Sometimes a paragraph generates a new page because it's been set up to do exactly that. Try right-clicking an empty paragraph, and select Paragraph. 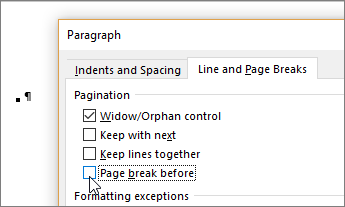 On the Lines and Page Breaks tab of the Paragraph dialog box, clear the selection from Page break before, and then click OK.
As a last resort, you can get rid of a trailing blank page by saving the document as a PDF, leaving out the last page. Note: These steps work for eliminating blank pages only when they're at the end of a document. Also, the option for specifying a range of pages is available only in Windows versions of Word. Go to File > Save As, pick a place to save the file, and then for the Save as type, choose PDF. Still in the Save As dialog box, click Options. Under Page range, choose Page(s), and then specify your non-blank pages. 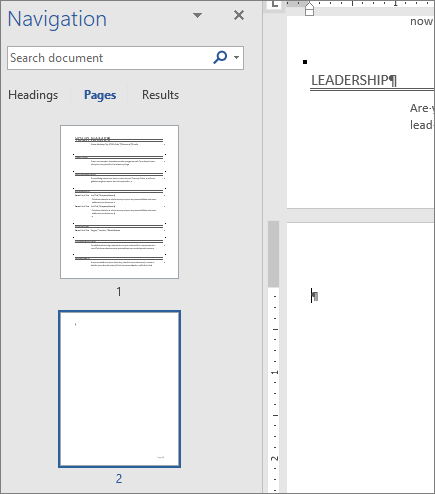 For example, if page 5 of your document is the blank page you can't get rid of, specify pages from 1 to 4. Page breaks tell Word where to start a new page. A manual page break might be making an unwanted blank page in your document. To see manual page breaks, switch to showing paragraph marks: Press Ctrl+Shift+8 (⌘+8 on a Mac). Now you can select the page break and delete it. Tip: To more easily find section breaks, try switching to Draft on the View tab. Double click the section break. On the Layout tab of the Page Setup dialog box, click the Section start drop down and select Continuous. Want some practice deleting pages in a sample document? This Delete a Page learning guide gives you exercises in deleting pages, simple to complex, with a link to an answer key. Download from the link, or type Delete a Page in the search box in File > New in Word (versions 2013 and later, Windows and Mac).